Conor Mcgregor once claimed he was always humble in victory or defeat. That was definitely not true. Six months on from his humiliating defeat at UFC 229, he is still beefing with Khabib, but now on Twitter. 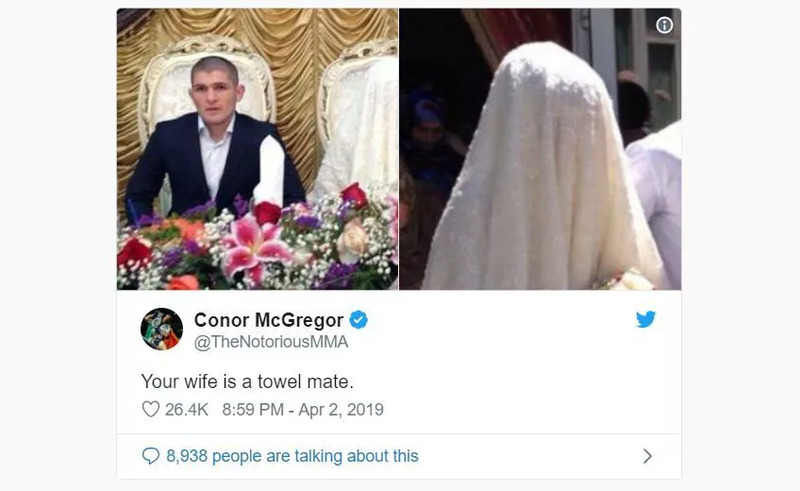 He posted a Tweet with the photo of Khabib and his wife with the caption “Your wife is a towel, mate”, referring her Islamic wedding veil to a piece of towel. He later Tweeted “Plot twist, its a goat”. Although many people found it funny and harmless, the majority, especially the Muslim community were outraged and for good reason. For starters, bring someone’s wife who did absolutely nothing to you, is plain wrong. Insulting a man’s family is one of the lowest acts you can do. Another reason why Conor faced backlash is because many considered it racist or more precisely “Islamophobic”, meaning he is insulting and prejudiced towards Muslims. Conor faced many death threats, and many flocked to his social media to insult his wife and even baby, which we found quite disturbing.